Only one in 13 people feel confident they could carry out first aid on those ill and injured, a survey suggests. The British Red Cross quizzed 2,000 people in the UK about their knowledge and ability to help in a series of emergency situations. 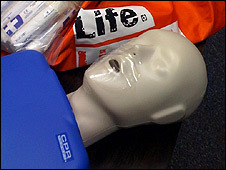 The survey revealed that people were particularly weak when it came to CPR - chest compressions and mouth-to-mouth. The charity said the findings were worrying and urged trainers to be more creative in designing courses. It said this could include steps such as online training, putting information on internet video site YouTube and sending trainers out to places like zoos and fairs to reach out to people. As well as organisations like the British Red Cross and St John Ambulance, schools and businesses run training courses. But the charity also called for first aid to be made a compulsory part of the school curriculum as well as introducing more first aid questions into the driving test - both of which are currently under review. These measures have been taken in other European countries, including Germany and the Scandinavian nations, and have resulted in up to 80% of people possessing first aid skills. In the poll, the British Red Cross asked people about their knowledge of how to deal with a range of scenarios such as if a neighbour was bleeding heavily, if someone was unconscious or if someone was hurt and not breathing. Just 14% of people would know what to do in all the situations, but half of those would be unwilling or not have the confidence to help. Fear of getting something wrong was cited by many, although some also said they were concerned about getting sued. The charity said the findings were extremely worrying as an estimated half of all A&E visits could benefit from some form of first aid. However, the British Red Cross said it took comfort from the finding that 60% would be willing to try to help if they felt they did have the skills. Joe Mulligan, head of first aid at the British Red Cross, said: "The positive thing this research shows us is that there is great willingness from the public to step in, but a lack of confidence or fear of getting something wrong is holding people back. "In the same way that everybody knows to call 999 in an emergency, we need to make sure everybody knows what to do until the ambulance arrives. "We need to make first aid simple, easy to understand and relevant to people's lives. "The onus is on us as first aid providers to find new and creative ways to reach more people, and get the message out there that all of us have the ability to save a life." Jonathan Fox, of the Association of Professional Ambulance Personnel, said: "This is definitely something we would echo. We really need to rethink our approach to first aid and schools is a good place to start."